How much is Stormy Daniels Worth? Stormy Daniels net worth: Stormy Daniels is an American adult film actress, screenwriter, and director who has a net worth of $2 million dollars. Stormy Daniels was born in Baton Rouge, Louisiana on March 17, 1979. She is one of the most well-known adult actresses and has been inducted into the AVN, NightMoves, and XRCO Halls of Fame. Daniels is also an aspiring politician who considered running against incumbent David Vitter for the 2010 Senate election in Louisiana. She started stripping at 17 years old. She eventually moved on to the adult industry. Daniels has starred in more than 180 adult films and has produced more than 65. She has also won more than 40 awards. Stormy was formerly married to pornographic actor and director Pat Myne. She is now married to another adult colleague named Brendon Miller. She is currently retired from acting in adult movies but she performs regularly around the country at strip clubs as a featured dancer. Donald Trump relationship: A January 2018 Wall Street Journal article alleged that Stormy Daniels had been paid $130,000 in hush money to stay quiet about an alleged sexual encounter with Donald Trump. The alleged payment took place a month before the 2016 Presidential election. The encounter allegedly took place in July 2006 after a celebrity golf tournament in Lake Tahoe. At the time, Trump would have been married for one year to Melania Trump. For many months, Ms. Daniels denied the affair, as did President Trump. 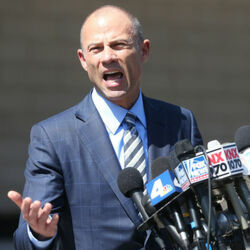 However in February of 2018 Stormy filed a lawsuit against Mr. Trump claiming that he never signed the paperwork that was needed to make their arrangement private. As part of this lawsuit it was revealed that Ms. Daniels was indeed paid $130,000 by Trump's personal lawyer Michael Cohen. In March of 2018 she offered to return the $130,000 to be able to speak publicly about their alleged affair. Stormy Daniels Net Worth: How Much Money Does The Adult Star Have In The Bank And Make From Her Appearances?